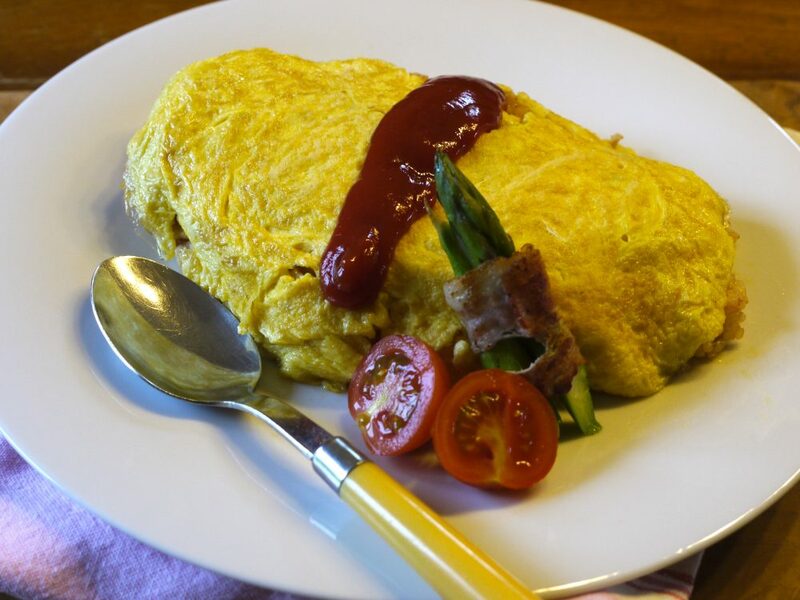 Omuraisu means Omelet with Rice. The best known kind contains chicken stir-fried rice flavoured with ketchup (or tomato sauce). My favourite Omuraisu omelette uses half-cooked egg. This way, the first bite of Omuraisu is a little runny, so that it mixes well with the ketchuppy fried rice! We Japanese tend to like a more yellow yolk. Of course, the colour depends on what the chickens eat, so a very yellow yolk might be not a natural colour. Here in Switzerland, it depends. I bought organic eggs, and the yolk was yellow, so it appears this is not necessarily a chemically induced colour! For stir-frying rice, use already cooked leftover rice. Just-cooked rice is not suitable for stir frying, because it’s sticky. I always use leftover rice. Warm it up in the microwave or pour hot water over it (to take off the stickiness), then fry. For fried rice, other kinds of rice such as long grain, basmati, etc… are better than Japanese rice. I normally stock some rice in the freezer, and using Japanese rice is easier for me. Also for this Omuraisu, the slight stickiness makes it easier to shape. I’ve always thought Omuraisu was a meal for children, but why shouldn’t adults enjoy it too? Mix well eggs, soy-milk, salt and pepper, set aside. Chop the onion finely. Cut the chicken into small pieces. Warm up rice in microwave or pour hot water and take off the stickiness. Heat up a frying pan, add some oil (out of ingredients), and stir onion until translucent. Add the chicken and stir, season with salt and pepper. Set aside. Heat up the pan and add oil (out of ingredients), stir fry the rice briefly over high heat. Put back the cooked chicken and onion into the stir-fried rice, and mix well together. Season with ketchup, salt and pepper. Set aside. Wash the frying pan and heat on a medium heat. Pour in some oil and butter, then add the egg and soy liquid. Stir the egg and mix well with oil and butter. When it starts to settle, put the stir-fried rice in the middle of the egg mixture. Cover rice with the egg using the edge of fry pan. Put a plate over the Omuraisu and turn it over. Serve with extra ketchup in the middle.